Back in January HEXUS reported upon a new partnership between Philips and Razer. The Philips Hue API and the Razer Chroma ecosystem became entwined for "a new level of spatial immersion," as you gamed on your Razer Chroma equipped PC. Razer's system syncs Hue lighting with its Razer Synapse 3 software and might be the best choice if you have RGB LED Razer hardware in your PC. However, users of the new generalist PC/Mac software don't sound like they will miss out much. With the new Philips Hue Sync software you can now enjoy lighting synchronisation with movies, music, and games on any PC or Mac. Philips explains that the system "captures content you’re watching, listening to or playing and translates it into an immediate lightscript for an immersive experience". In movies and games that seems to translate to ambilight style lighting, that is complimentary to the colours on screen at any time. In music mode Philips Hue Sync listens to the beat, dynamics and type of song to create lighting effects. There are further settings to adjust whatever content consumption is going on - changing intensities, colour palettes, and so on. To get your Hue products to sync with your PC (Windows 10) or Mac (Mac OS Sierra or newer) you will need a few things. First of all you have to make sure the Hue Bridge and any Hue lighting products you wish to control are powered up and connected. 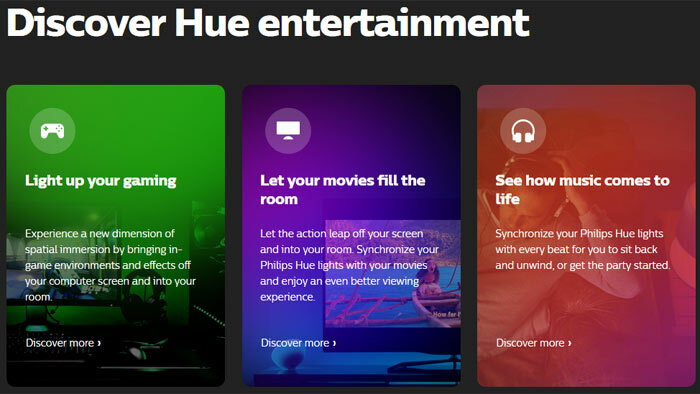 Then you set up an entertainment area in the Philps Hue app. Lastly you run the Philips Hue Sync app on your PC or Mac. 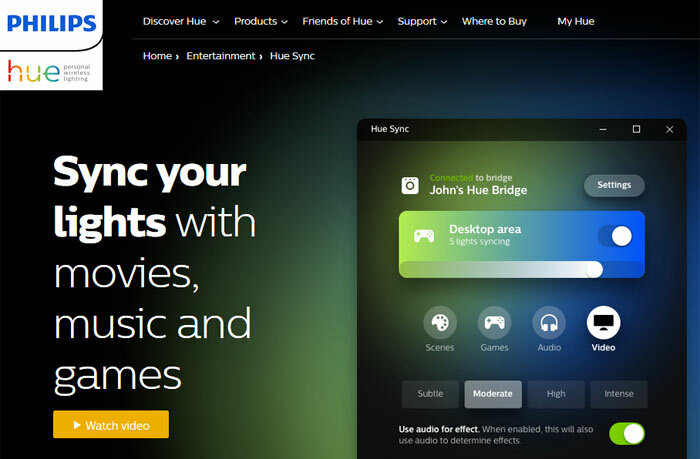 If your PC or Mac isn't in the location you want to enjoy the synchronised Hue lighting experience - your living room for example - don't forget you could stream the desired content to your living room TV and enjoy the Hue Sync experience there. But, why though? What does this really improve or offer someone? I think this comes under “interesting at the time, but it got annoying quickly”, and worse, it has to know everything you're displaying, hearing, and seeing to be able to function. So that's pretty creepy. All for lights. But, why though? What does this really improve or offer someone? Well, for music that'd (potentially) mean flashy disco lights, which means you'd be able to go clubbing without leaving the comfort of your swivel chair…. Some songs might also benefit from mood lighting. Games… I guess bright white-ish flashing all around you when you shoot in an FPS would be one somewhat immersive example, as would red flashing when you got shot or progressive red when you were low on health/bleeding out. Maybe a couple of other similar effects. Movies…. Dunno. I'm still old school on that one, which means surrounding lights are OFF and I'm in cinema mode! However, some people are far more receptive to and affected by colours than others. Case in point, the LED strip light threads, where people more au-fait with such things told me all about how I'd want Warm White, Daylight or Cold White tube lights. This all reminds me of a drummer I used to know, who said that he doesn't play rhythms or beats or anything - He listens to the music and ‘sees’ colours in his head, so he just closes his eyes and plays whatever colours he sees…. Don't unnerstan' it myself, but he was a bloody good drummer so I can't really argue! worse, it has to know everything you're displaying, hearing, and seeing to be able to function. So that's pretty creepy. All for lights. Disco lights, even piddly DIY ones that you buy from Maplins, have had the function that sequences their flashes based off the music you play. This is no creepier than that. It'll just read the same sort of info from your audio and/or monitor outputs and do something similar. I have Hue lights and I find a red background good for watching any TV. I don’t like watching TV in total darkness, but red light doesn’t affect night vision and is (for me) more restful.